Kolvitsa. General info for travellers. Three reasons to recommend Kolvitsa to travellers: (1) high concentration of good views; (2) easy access; (3) location along the Kandalaksha-Umba-Varzuga route. Dmitriev cape and entrance to the Kolvitsa bay. Photo by Georgy Kas’yanov. At the core of this book is a series of interviews with Kolvitsa old-timers, the oldest of whom were born in the late 1920s or early 1930s. Many of those interviewed are direct descendants of a small group of Karelian migrants who moved here and founded the village in early 90s of the 19th century. These interviews were mostly taken and processed in the Fall of 2014 and, together with historic background, provide a comprehensive view onto the origin and history of the village. A stone that commemorates 120 years of Kolvitsa. Photo by Gennady Alexandrov. “A trip to Kolvitsa” won the First All-Russian competition “Cultural mosaic of small towns and villages” (the Timchenko Fund). The project was performed by youth movement “EcoDozor” (EcoWatch) of the Kola Ecological Center jointly with youth center “Harmonia” of the City of Kandalaksha. Immediately involved were Ludmila and Gennady Alexandrov, and Alexandra Goryashko. Artist Valentin Myzdrikov developed the book’s cover. Kolvitsa, one of several villages along the Kandalaksha coast of the White Sea, has a rich and unique history. Unlike other, Pomor, villages, Kolvitsa was founded by migrants from Karelia, and thus maintained, for many years, its cultural and linguistic uniqueness. Been there. Here are a few photos from the event. 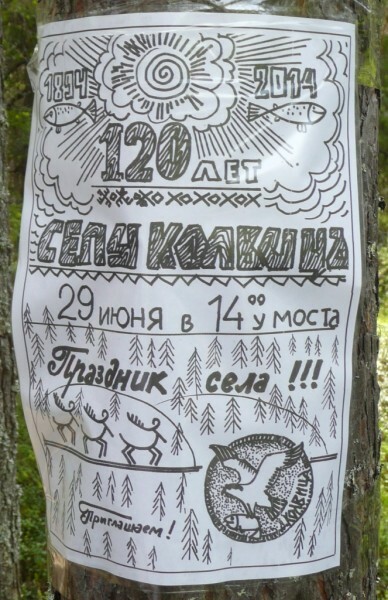 The village of Kolvitsa is celebrating its 120 year anniversary. 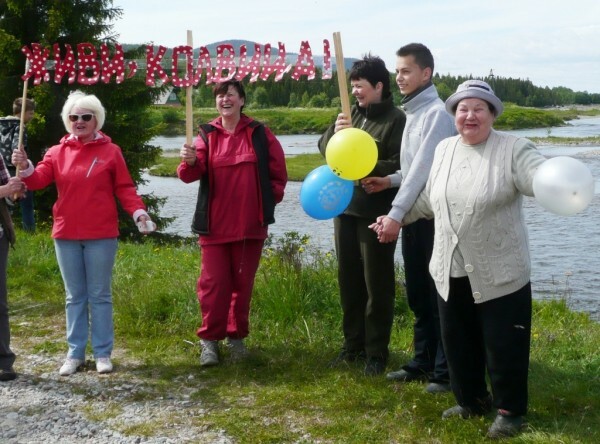 The Youth Center “Garmonia” and Kola Ecological Center invite everybody to the village celebration to be held on June 29 at 2pm on the bridge over the Kolvitsa river. The program includes opening a memorial stone and a meeting with Nikolay Kolychev (the author of Kandalaksha anthem) and other Kandalaksha poets. A tour along the eco-trail “Kolvitsa river” towards the Black Padun waterfalls will be offered. A regular bus to Kolvitsa is leaving the Kandalaksha bus station at 12:30. For more information call (8-815-33) 9-40-46 or +7 921 162 09 49, ask for Ludmila Alexandrova, the head of the Kandalaksha Tourist Info Center. Kandalakshsky District, the Gateway to the Land of Kola. A new guide. A nicely put together small booklet on Kandalaksha and area. Particularly valuable is the description of the border crossing at Salla and other travel technicalities. At the moment it is in Russian only but the author is a good friend of mine, and I’ll be getting Pasha to translate and adapt it for English-speaking travellers.